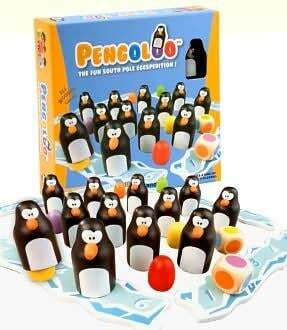 A fun new way to stretch the mind, Pengoloo tests kids memory as they race to match coloured eggs and collect penguin pals to win. In the Pengoloo game, players must first put an egg in each penguin and mix them up in the center and pass out iceberg scoreboards. To start playing the Pengoloo game, the youngest player rolls the 2 multi-coloured die and then has 2 tries to find eggs under the penguins that match one or both colours on the die. If a player finds one matching egg, he or she places the penguin by their iceberg. If the player finds both matching eggs, he or she places both penguins by their iceberg and plays again. Watch out - finding eggs in the Pengoloo game is trickier than it sounds since you have to remember their locations. The first player to collect 6 penguins wins the game! -2 coloured die. For 2 to 6 players. -Safety WARNING: CHOKING HAZARD - Small parts. Not for children under 3 yrs.